Continuing our adventures in Barcelona: after paying some rather steep prices for tapas, we finally got some good value for money at Vegetart. It’s a nice little takeaway deli place. When we visited, they were stocked up with burgers, hummus, lentil dishes and cakes. I had read somewhere that they do excellent tortilla, but they didn’t have any mid-afternoon when we visited. 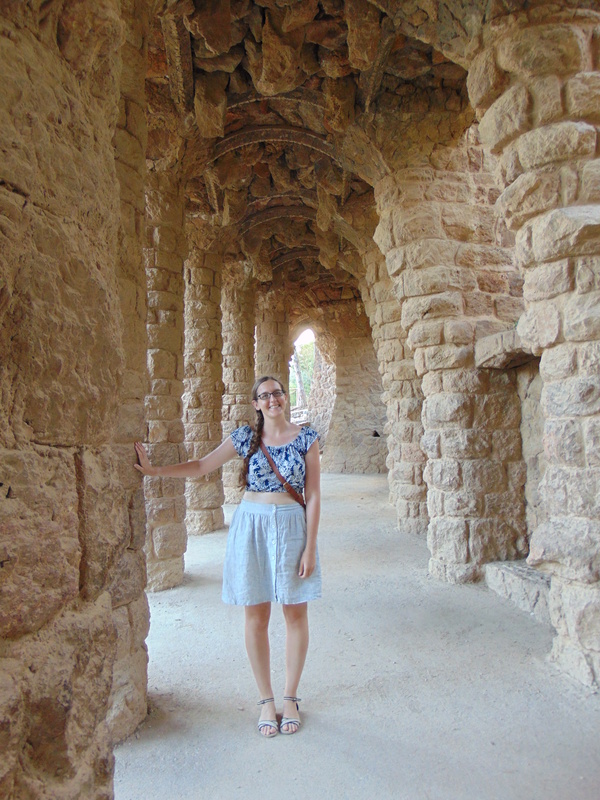 We got a little picnic to take to Parc Guell later that day (top tip: book your tickets for the Parc. We saw lots of people turn up thinking they could just pop straight in and being disappointed to find that they had to wait a few hours for entry to the monumental park). 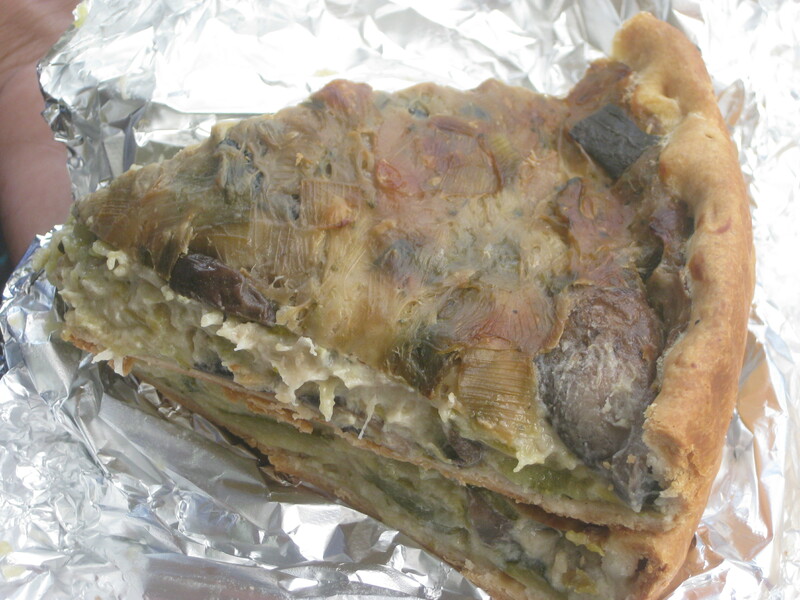 The mushroom and leek quiche was almost perfect: creamy filling, delicious pastry, but just short a touch of seasoning. 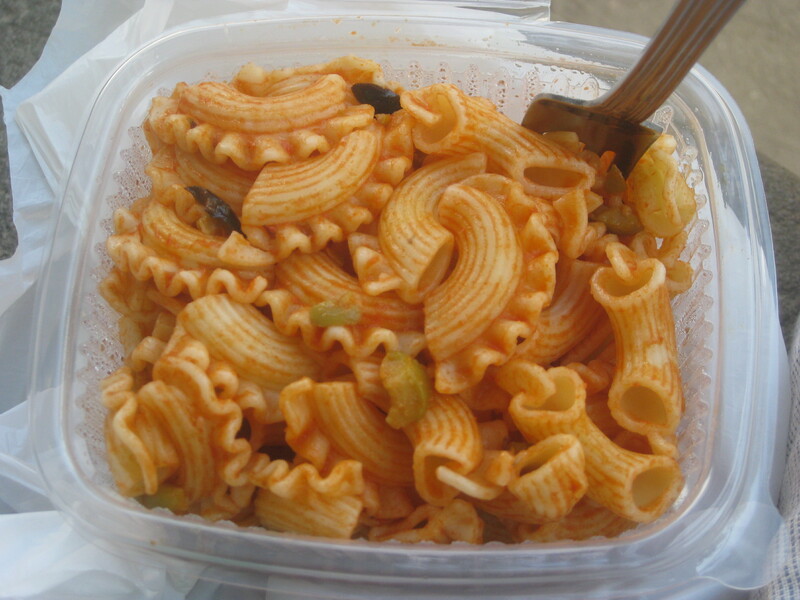 We will also got a little pot of pasta which was packed with flavour from the tomato sauce, olives and capers. It would be rude not to have a cake, surely? 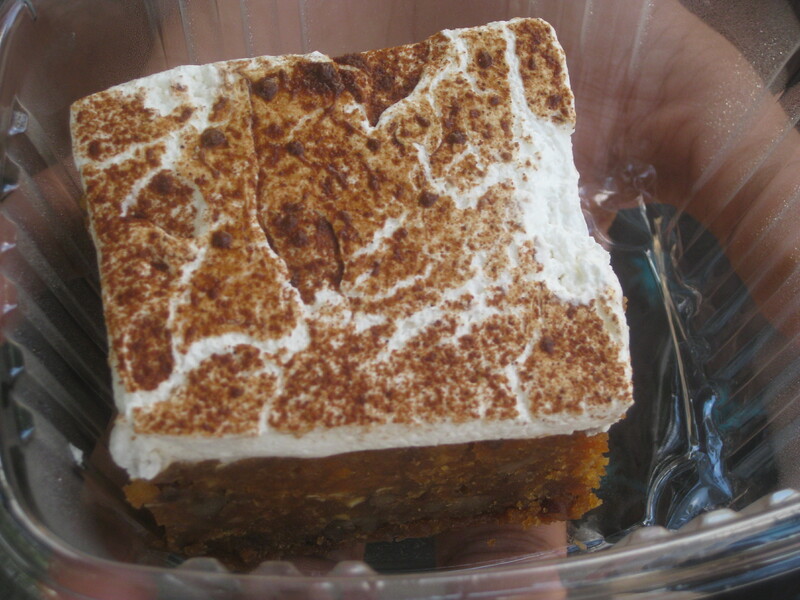 This carrot cake was moist and flavoursome, and the icing was perfect. I would definitely recommend this place for your visit to Barcelona. And while you’re picking up your picnic, you should stop in at Uay Balam just down the road. We saw its sign proclaiming some vegan treats in this gelateria and dessert shop, so we made a little detour to investigate. There were five flavours of vegan gelato (chocolate, strawberry, peach, watermelon and grapefruit), and we were given a free spoonful of each to help us decide. 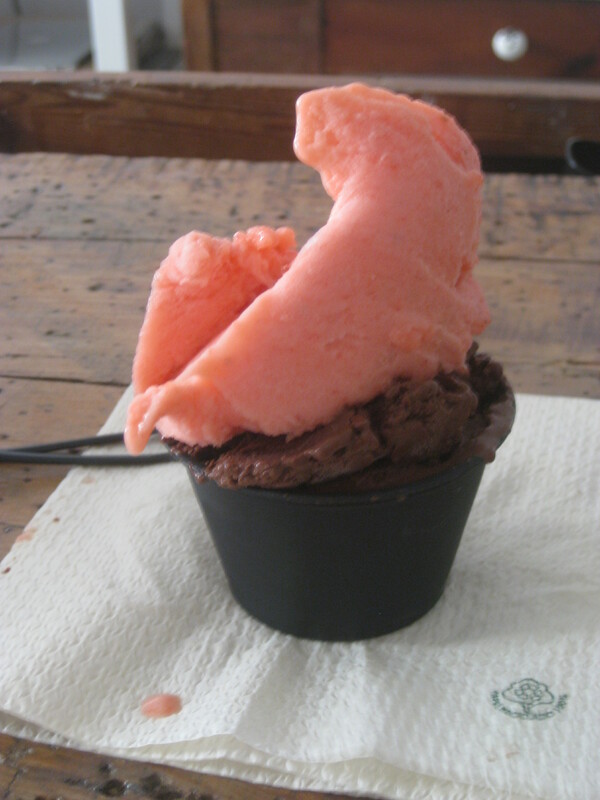 The cones weren’t vegan, so we enjoyed a little cup piled high with rich chocolate and refreshing strawberry gelato. It was fantastic! Our time in Spain was relatively light on breakfasts, but we enjoyed brunch at Dos Trece (UPDATE: closed June 2017). It has four or five vegan brunch items and is a bright, spacious place with fast service. I had the French toast, which was a wee bit too blackened on the bottom for my liking. 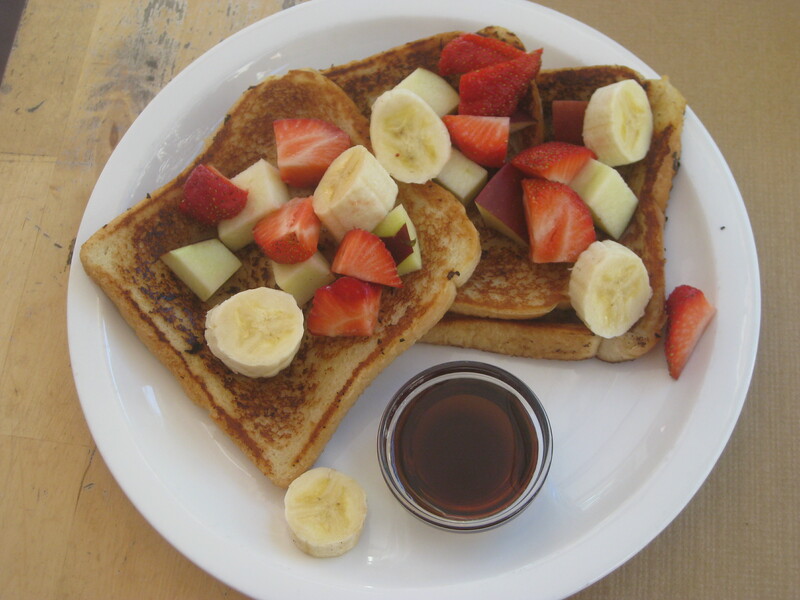 Still, it was delicious with the fruit and maple syrup. 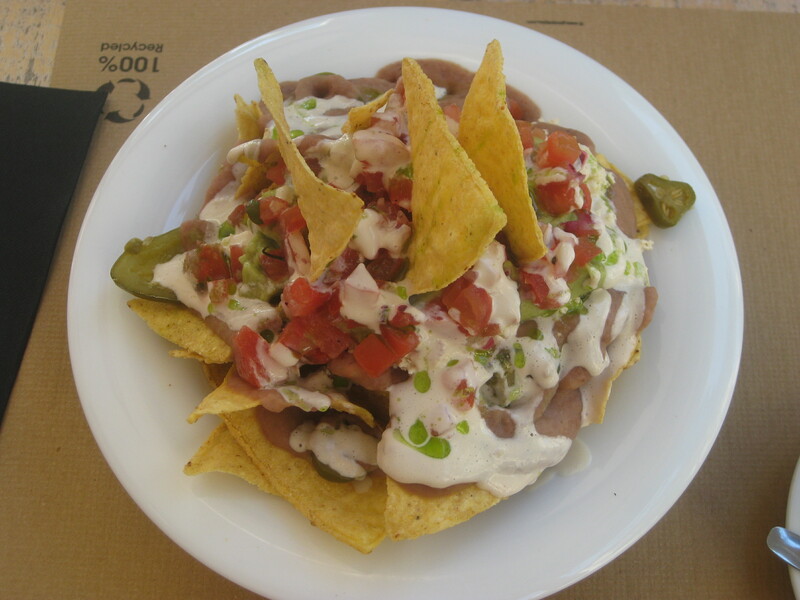 Dr HH enjoyed his nachos, and as you can see it was a gigantic portion. It featured guacamole, beans, salsa and tofu – the tofu was a bit bland (he reckons it was just crumbled, unseasoned tofu from a packet), but otherwise it was a rather exciting start to the day. In Cat Bar we had some very impressive burgers. It’s one of the few places in Barcelona (and possibly in the whole of Spain) which serves food continuously in the afternoon, allowing hungry Brits to eat at a respectable hour like 6pm, rather than battling on till some ridiculous time around 9pm when we should all be tucked up in bed. Yes, I liked Cat Bar. There were about 7 burgers on the menu, and you order on a little form that you take to the bar. This is Dr HH’s Mexican Red, which he said was pleasantly spicy and had good structural integrity, which is very important – nobody likes a burger that collapses in your hands. 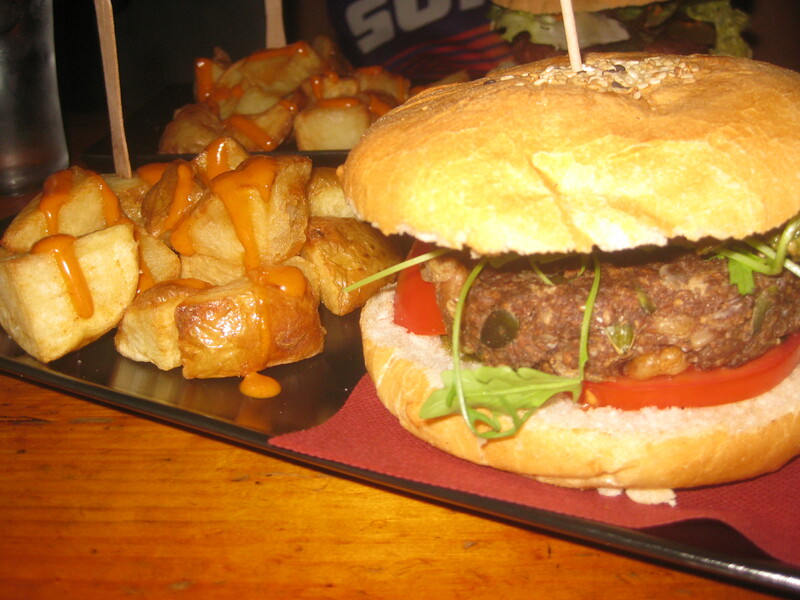 I loved my Crazy Burger, which had a patty full of nuts and seeds. Combined with the pesto in the bun, it was very tasty. We both ordered patatas on the side. They were a little too big to be bite-sized, and could have been crisper, but we were happy. And finally, we ate at one of the few non-vegan places of our trip: Rasoterra. It was quite fancy, and they only just squeezed us in without a reservation, so I would recommend making one if you want to go. It definitely wouldn’t be my top recommendation though. After two weeks of all-vegan eating, it was a little disappointing to be back on a reduced menu. The vegan tapas dishes were not plentiful, and there was only one vegan wine available by the glass (fortunately I am not at all particular). 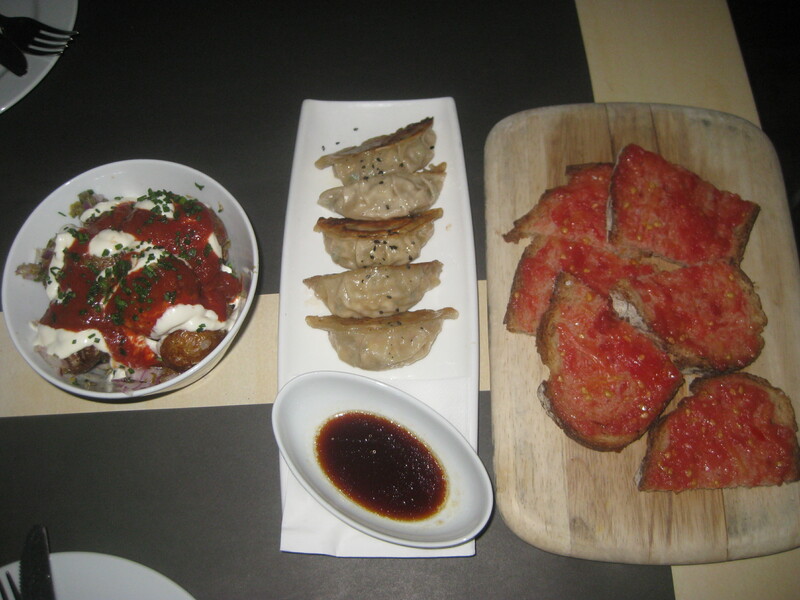 We got all three vegan tapas: the tomato bread was basically what you would expect, the veg and tofu gyoza were lovely, and the patatas bravas were like mini jacket potatoes: crispy and delicious, and very different from the other potato dishes we’d tried. It was all fine, but generally unremarkable. All in all, I found the tapas scene in Barcelona a bit underwhelming, either unexceptional or too expensive. Barcelona itself was great. 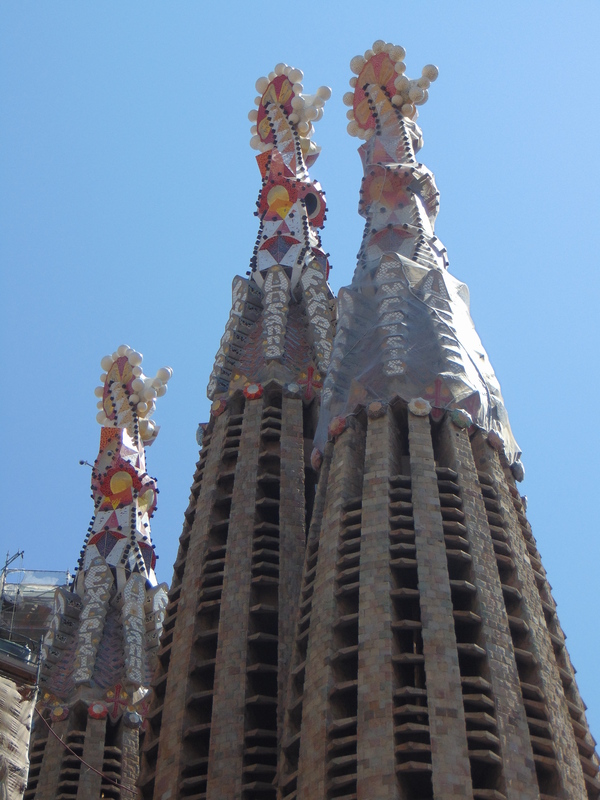 We spent most of our time on Gaudi-inspired pursuits. 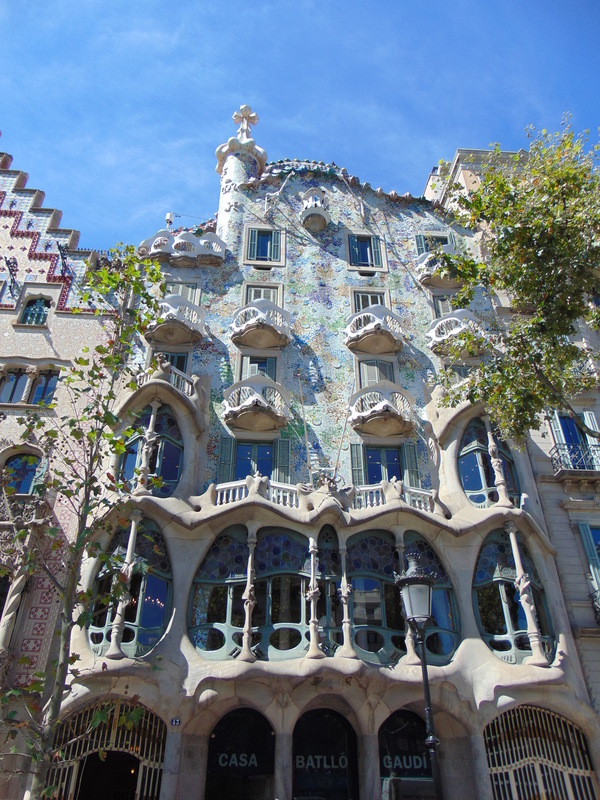 The Casa Batllo was expensive and crowded, but getting up onto the roof made it worthwhile. We didn’t pay to go in the Sagrada Familia, but it was still fascinating to walk around it and try to catch all the details. 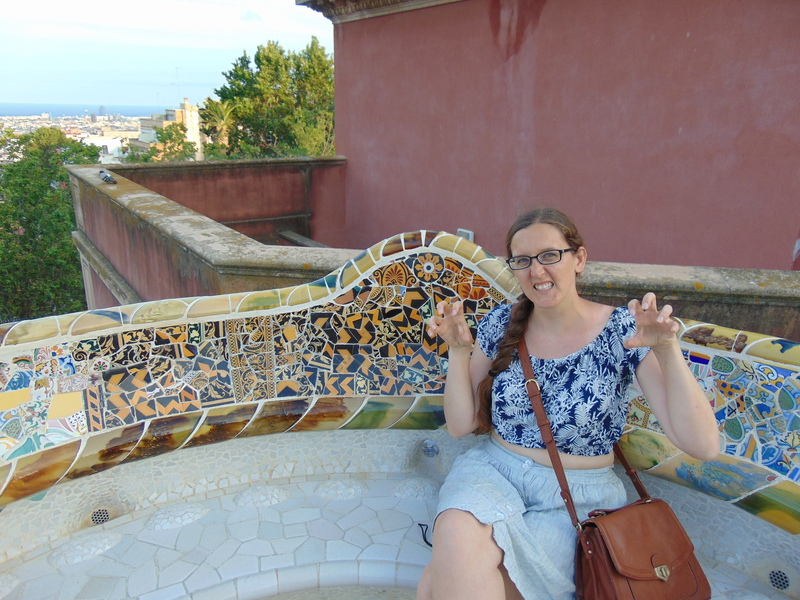 Parc Guell is worth a visit, especially if you are a fan of tiles. 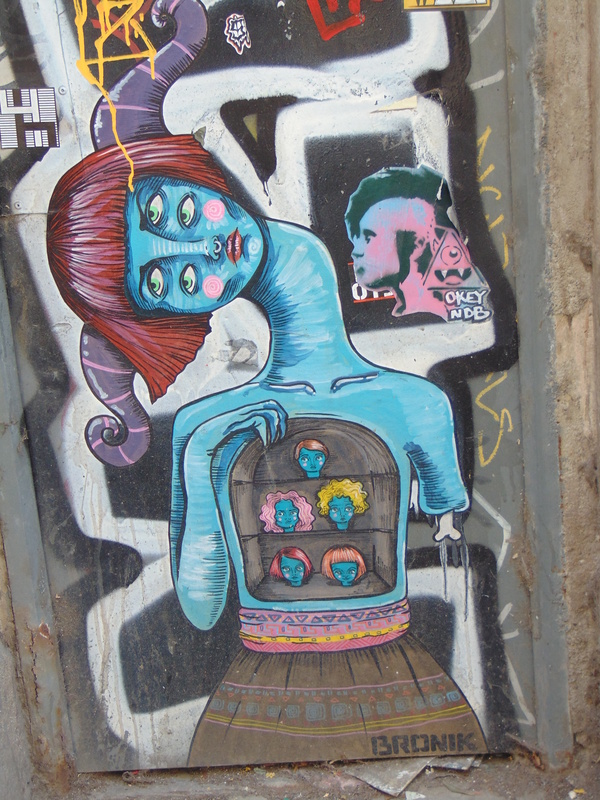 And sticking with an arty theme, we also took a street art tour, which was very interesting. It didn’t yield any single, huge impressive pieces like other cities have before, but there were lots of little bits and pieces and we found out a lot about local artists and techniques, so it’s definitely worth a few hours of your time. 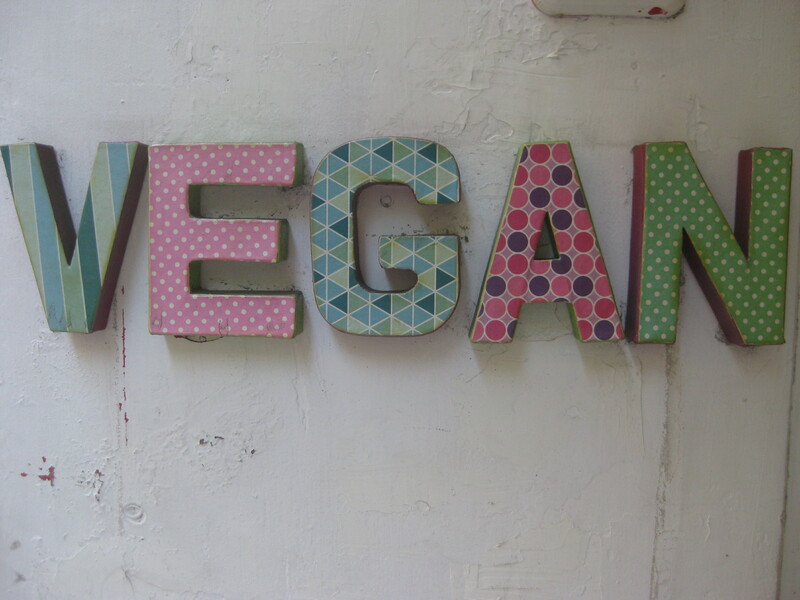 The big three cities in Spain are definitely vegan friendly, and have plenty to keep you entertained too. We really enjoyed our time there – if only the restaurants opened at more reasonable hours! 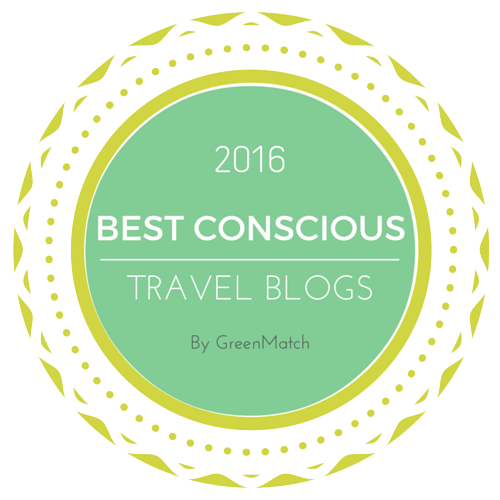 This entry was posted in Travel and tagged Cat Bar Barcelona, Dos Trece Barcelona, Rasoterra Barcelona, Uay Balam Barcelona, vegan Barcelona, vegan travel, Vegetart Barcelona. Bookmark the permalink. Your outfit looks perfect for traveling. Nice and cool but very comfy. Thanks – it was at least 30C every day, so staying cool was tricky! I think I eat at all-vegan places 90% of the time, so it’s always a bit of a slap in the face when I’m back down to limited options. Even when they are good options, I feel a bit bitter! It is always deceiving to her celcius temps since each degree makes a bigger difference. Like typing in 30C converts to 86F and that seems manageable. But 32C is 90F and that is just hot. XD Right now we are going through a heatwave and it is always between 32-36C but with the humidity levels the weather reporters say it feels more like 40C. It is nice when occasionally omni places have substitutes so you can ALMOST order anything from a menu. I’ve been to a few places where you choose the item then “choose a protein” so 90% of the menu can be made vegan. But that might be more of an American thing since I keep hearing we tend to customize our foods more often. I believe one of the British newspapers always puts the temperature in headlines in Farenheit when it’s hot and Celsius when it’s freezing, to achieve maximum shock value! 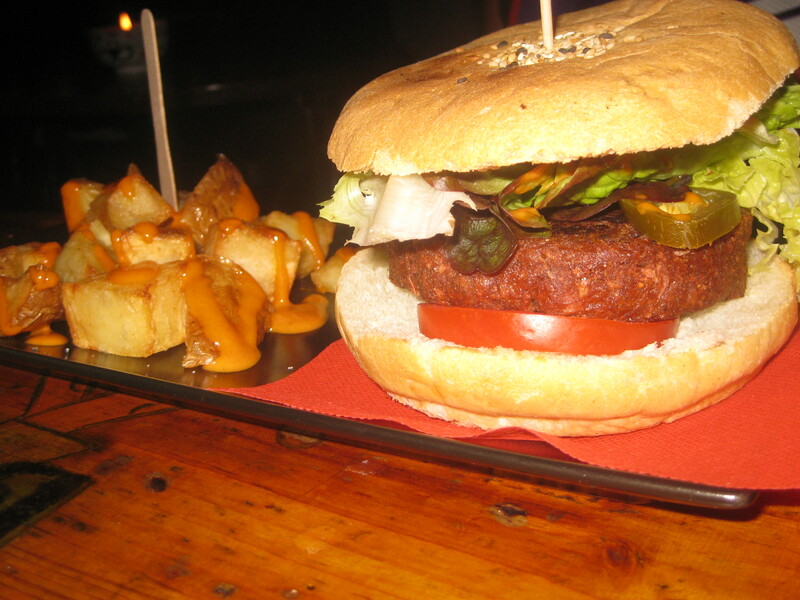 I really love Barcelona and it’s gotten even more vegan friendly since I was last there. I love the look of the quiche you tried so Vegetate is going on my must visit list. You’ll be spoiled for choice, there were loads more places we just didn’t have time for! It’s great to see cities with such a thriving vegan scene. Not vegan myself, but it looks like there are a lot of good choices for anyone who is.